That is the reaction we would get from just about everyone who happened to come across the little tidbit of information that my 10 year old didn’t know how to ride a bike. Not only did she not know, but she absolutely refused to learn. It’s been this way for years now. She will go 40 mph down a mountainside on skiis despite having rammed head on into a tree when she was probably 4 years old. No fear to get back up. She will ride on a scooter. A skateboard. She will get on any horse and enjoys not just a leisurely walk. But an all out run. Yet she won’t get on a bike. 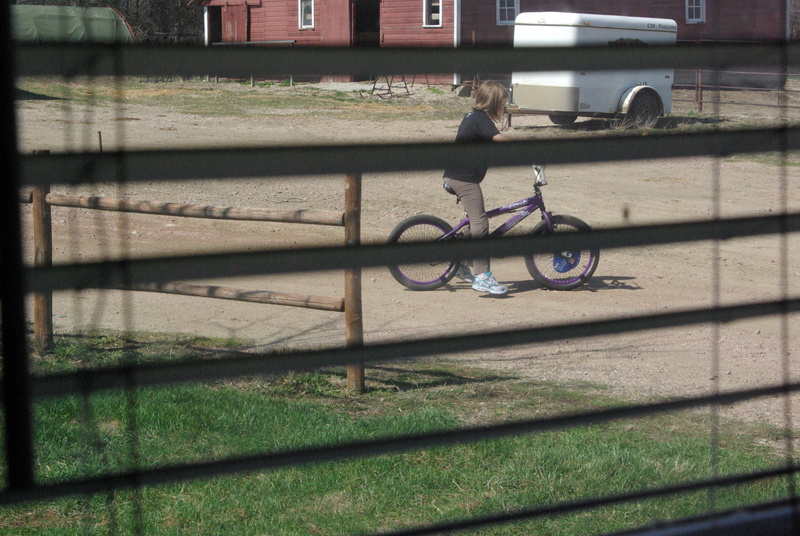 I don’t know if it was the 4th of July neighborhood parade incident years ago that scarred her when she fell and the decorative red, white and blue pipecleaner on the handlebar went clear through her hand ..
Or if she .. for some reason .. has just truly not wanted to learn. “Not me,” she would reply. “Not unless it’s the law. Is it a law?” she used to ask. I was getting ready to call the Governor’s office. Who I knew perpiherally through work and who used to live in our modest little neighborhood. I was certain would help me out. The Cowboy and I were determined with some lovely downtime for us this week .. that she would learn. And she’s been softening to the idea more and more .. especially since the handsome young boy she often hangs out with now and who lives next door to us rides his bike all the time. “What do you want to do today,” we asked as she woke on Saturday. “I want to ride,” she replied. “Well, if you want to ride the horses later today, you’ve got to first try to ride a bike,” the Cowboy and I said, united. She didn’t want either of us to help, at least not at first. We left her alone. For awhile. Two minutes came and went and she was down at the end of the Cowboy’s gravel drive still trying. I went to see if I could help. We went down the road and back. A couple times. The dog in tow ..
She actually listened. Didn’t get mad. Didn’t fuss. She tried. And after a few more attempts ..was up and pedaling. Next try, just a little bit more. And a little bit more. By this time, we were coming back up the drive and nearing the porch. The Cowboy asked if I could see the smile on her face. I couldn’t. But knowing that made my heart smile. “She’s on the bike,” he said. 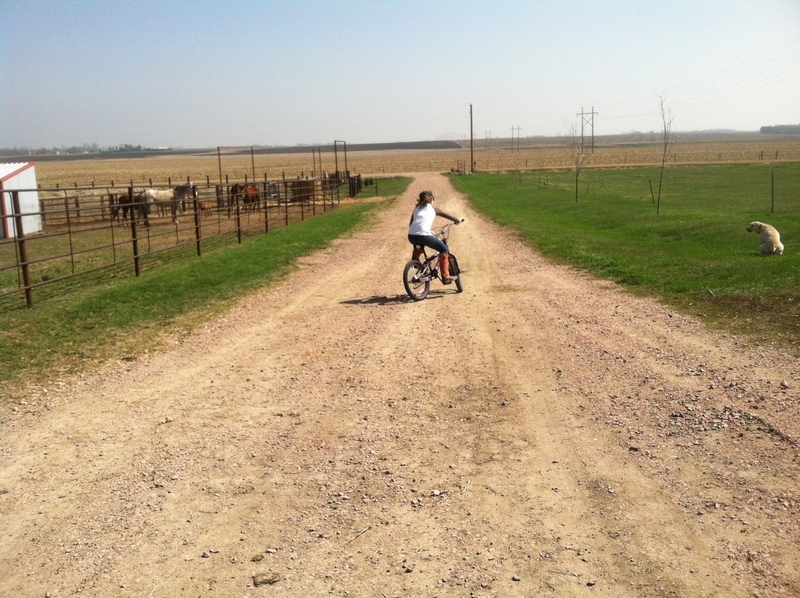 This entry was posted in Biking, Blogs, Children, Cowboy, Faith, Life, Lifestyle, Love, Parenting, Pre-teen tantrum, South Dakota, Tweens, Wisconsin and tagged Afraid to try, Bike ride, Children, Cowboy, Faith, Family, Horses, Learning to ride a bike, Life, LIfestyle, Love, New bike, Parenting, South Dakota, Wisconsin by Carleen Wild. Bookmark the permalink. Wonderful. It’s so interesting, the way we all want to do things on our own schedule. Good for her. you are a wonderful teacher ..